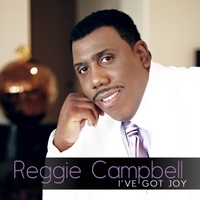 Reggie Campbell brings uplifting original Gospel praise and passionate worship to this new release. The I've Got Joy CD will bring you hope and joy and take you on a journey to the heart of God where many are being touched deep within their soul. The I’ve Got Joy project was birthed out of a heartbroken tragedy, of losing his young wife. Reggie was forced to search his heart, draw closer to God, and find peace in the gift of music. God turned his mourning into a new song of joy and hope! This CD project is the result of that journey. Reggie’s songs are currently playing on radio stations across the USA. The songs being played include: I’ve Got Joy, My Hope, and We Wait On You. He is quickly becoming known as a National Gospel Recording Artist and a songwriter, keyboardist, choir director, worship leader and minister. Just a few years ago Reggie played a major role in several artist's recording projects; including the artist, Jimmie Thomas of the Potter's House; Bishop T. D. Jakes church. Reggie has the very unique worship style and it has been noted that he has styles similar to William McDowell, William Murray. His Gospel style is closer to John P. Kee. Celia King Murray who sings throughout the cd has a vocal style familiar to Yolanda Adams, Fantasia Barrino, and Jenifer Hudson. He has been blessed to minster in churches nationally and internationally. He has ministered at New Birth & Bishop Timothy Fleming, and Salem Bible Church & Rev. Jasper Williams. Furthermore, he can be regularly seen on the Trinity Broadcast Network as a featured guest artist and respected Psalmist. Minister Reggie is known for ushering in the presence of god through prophetic teaching, bringing a message of joy, hope, love, peace and encouragement. His ministry is led by the Holy Spirit through praise and worship, words of knowledge, wisdom, and prophetic speaking. Before losing his wife Lisa, Reggie and Lisa dreamed of recording a CD together. Through their music ministry, they had the privilege of leading thousands to Christ. They ministered together until Lisa passed away in 1998 after a long battle with Lupus; leaving Reggie to raise their family as a single parent. Now that his children are young adults, he is actively pursuing the call of God and the ministry. God turned his mourning into a new song of joy and hope. Reggie currently resides in Phoenix, Arizona with his two sons. You can see more about Reggie and his events schedule by doing a internet search for Reggie Campbell or Fresh Fire Records. You can also find Reggie Campbell Music on Facebook to keep up with the latest news, radio stations airing his music and events. All these songs have drawn some arts that indicate someone losing. Nice voice with real emotion. I love these songs much. I have to hear these every night before going to bed. And feel someone to get back in dream. I love these songs much. I have to hear these every night before going to bed. And feel someone to get back in the dream. Wow, Wow, is all I am going to say. I was feeling a bit down when I started to listen but quickly it lifted my spirit into hope and joy and as I listened to the worship I found myself worshipping with Reggie and his team great singers! I can't wait for my friends to hear this CD. Reggie is going places! !